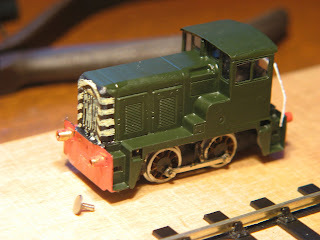 Further progress on the Class 02 diesel. 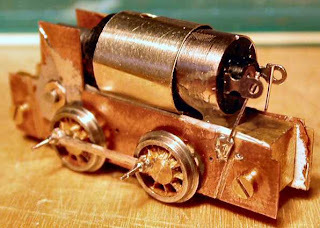 The painted photograph shows "almost there", with just the couplings and buffers to fit (one buffer loose infront of loco). The buffer beam colour still needs attention. The chassis is a fairly simple arrangement with a Faulhaber 816 motor. In its final form, there is a CT DCX75 chip above the motor (loads of space! ), and a cab light (LED). Once this is finished, I need to get back to the Class 04 wheels (up to about mark 8 so far ! ).